train PC games, railroads, and general topics of interest. At the bottom of some topics you'll now find some additional links to topics under a heading called SIMILAR TOPICS. These are topics whose subject is similar to the topic you're currently in. 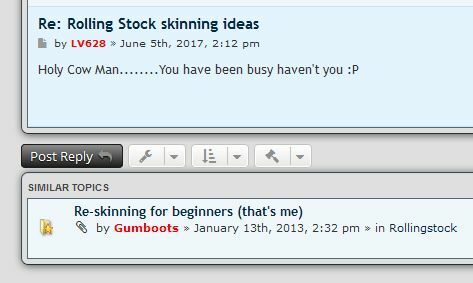 Here's a screenshot taken from the bottom of the 'Rolling Stock skinning ideas' topic. Once you've read this message you can hide it by hovering your mouse over the background and clicking the X at the far right. This will hide this message until it is changed.